It’s no accident that archaeologists love old rubbish dumps. Excavating ancient tips can reveal a great deal about the lives of the people who used them, and in just the same way, what we throw away in our modern dustbins will tell a lot about us too – even to the un-trained eye. While most of us perhaps wouldn’t worry too much about that prospect, if you happen to be a criminal, that might just put a whole new perspective on it. Just as fingerprinting and DNA techniques have become increasingly sophisticated when it comes to solving murders, the methods available to investigators sifting through a suspect’s refuse have changed beyond recognition over the last decade, making detection possible in many seemingly impossible cases. Welcome to the world of forensic waste – CSI for dustbins! There’s an old saying, “out of sight, out of mind” and it’s surprising how many people actually believe it about the things they throw out. Just because it’s in your bin and heading for the local landfill, it certainly doesn’t mean it’s gone and forgotten – and while forensic bin analysis hasn’t brought as many to justice as the TV’s Grissom, Mac or Horatio, more than a few crooks have been caught out that way. Much of the work of investigators in this field involves knowing what apparently innocent items may have played a contributory factor in the commission of crime, and then keeping an eye out for these residues in the waste they examine. Over the years this has led to a huge wealth of knowledge being amassed both within individual police forces and by law enforcement agencies across the world – and these days, crime has become as global as everything else, so collaboration often plays a key role in conviction. Changes in refuse collection over the last couple of decades have themselves provided some new criminal opportunities – even if most of the ‘crimes’ committed are fairly minor ones and not likely to end up with an appearance at the Old Bailey! The loss of the traditional British ‘dustman’ who came to your back door and collected your bin, emptied it and then delivered it back – all by hand – saw the introduction of effectively anonymous collections, first by plastic sack and now, increasingly by wheelie bins. 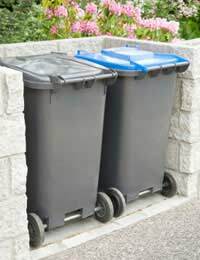 The rise of automation and kerb-side services means there’s little stopping anyone popping anything into someone else’s bin – and if we’re going to move along the route of fines for ‘prohibited’ waste, or for items in the wrong bin, then this could potentially make criminals of us all! More seriously, however, are those instances when, during times that particular resources were worth high prices, criminal gangs have hijacked aluminium or paper skips wholesale from recycling centres, arriving in the night with a flat-back truck to make good their escape. It doesn’t happen often – but it has been known! It’s surprising what you can fit into a wheelie bin. There’ve been massive dead dogs, unwanted breeze blocks – bizarrely wrapped up in brown paper on one occasion – and even entire engine blocks, but the one thing a wheelie bin seems uniquely designed for disposing of, is a corpse. It’s seldom been featured in the cop shows, although it was something that many in the waste management industry rather gruesomely suggested when they first began appearing on UK kerbsides, but as the following two cases show, it certainly has happened in real life. One Saturday morning, in the mid 1990s, not long after one Midland town introduced them, residents awoke to find police on their doorsteps, and one of their neighbour’s wheelie bin being removed – along with the body of an elderly woman it had been found to contain. The ensuing murder enquiry raged for the rest of the weekend and into the next week, until a touchingly sad explanation emerged. The poor lady’s son – a simple, harmless soul – had woken to find his mother dead in her bed, and remembering what they had done when his pet hamster had died, consigned her body to the council, in just the same way. Tragic – but there is a undeniable logic to it, isn’t there? More sinister is the 2008 case of the guitarist, the junkie and the Scottish landfill – involving 17 police officers, 15,000 tonnes of rubbish and, of course, another wheelie bin. When the junkie found the guitarist overdosed on the heroin he had supplied, and lying dead on the sofa in his house, he embarked on what the sentencing judge was later to describe as “an appalling course of conduct.” Having had his waste collected the day before, he hung onto the body for a further six days before heaving it unceremoniously into the bin, and then using the deceased guitarist’s mobile phone in an attempt to make people believe he was still alive, and so throw the manhunt that had begun, off the scent. It seems even the best laid criminal plans often go awry – and the junkie was clearly no Professor Moriarty! After a tip off – and inoculations against hepatitis A and B, polio and tetanus – 17 of Central Scotland’s finest, complete with protective suits, goggles, gloves and masks, painstakingly sifted through tonne after tonne of waste, and ultimately they got their man. No one would suggest that looking through piles of rubbish is a glamorous occupation, or that we’re really going to see a TV show entitled CSI Dustbin anytime soon, but there are times when it proves an undeniably effective – if often smelly – way of catching criminals. So, the next time you see one of the gang rummaging through a skip in a back-alley in New York, Las Vegas or Miami, you might want to spare a thought for the people who do that sort of thing for real, back here in Blighty!